People who are required to integrate receive two to four hours of classes per week. After a test and intake interview they are advised to prepare for the integration exam or the state exam. People who are looking to improve their language level receive two four-hour classes per week. After an intake interview and a test, a programme is set out and an appropriate method is acquired. The cost of a nine-week course is 1,000 euros. In exchange for which the participant gets taught by two teachers. The group consists of at least six persons and gets split when there are twelve. There are no classes during school holidays. However, there are workshops during those weeks. A highly educated participant can be prepared for the integration diploma in 18 weeks. State Exam Programme I will take a further two times 9 weeks and State Exam Programme II then takes another two times 9 weeks thereafter. Altogether 54 weeks. Sometimes additional exam training is required. The KNM (Knowledge of Dutch Society) and ONA (Orientation on the Dutch Labour Market) parts are integrated into the classes from A2 to B1. The ONA portfolio is discussed individually. Separate ONA courses are also available. En Nu Nederlands opts for a solid, complete method which allows you to keep going from home, behind your computer. These books and internet licences are included in the price. Not included are the exams. To qualify for a loan you are required to take language classes at a language school with a quality mark. 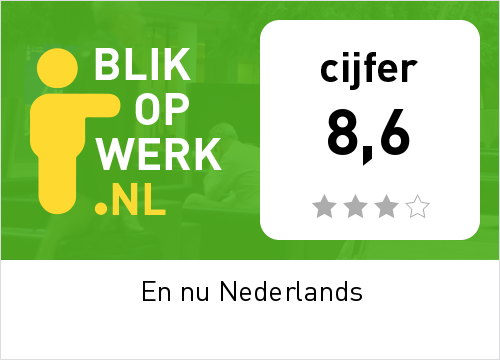 We have the Blik op werk quality mark, see www.blikopwerk.nl. We are monitored and inspected. The success rate and the satisfaction of our students are the two monitoring criteria.